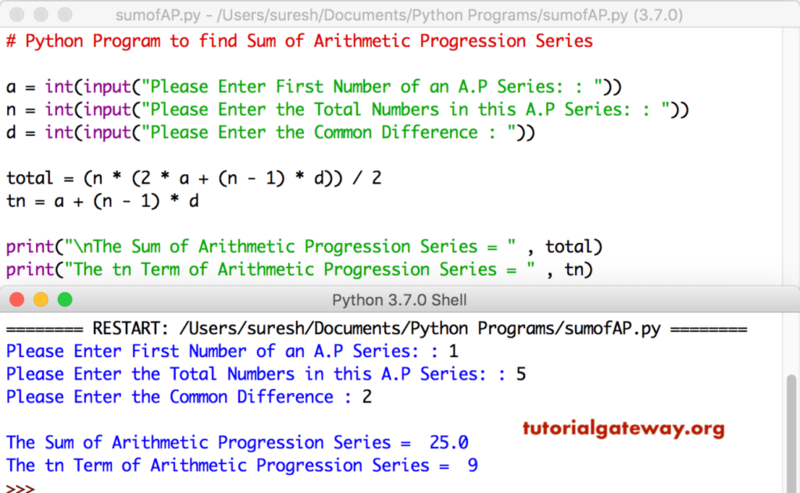 In this article, we will show you, How to Write a Python Program to find Sum of Arithmetic Progression Series (A.P. Series) with practical example. A.P. series is a series of numbers in which difference of any two consecutive numbers is always same. This difference is called as common difference. This Python program allows the user to enter first value, total number of items in a series, and the common difference. Next, it will find the sum of Arithmetic Progression Series. This program is same as above. Here, we used While Loop to display the A.P series, which is optional. In this Program, we are not using any Mathematical formula. This is same as first example. However, we separated the logic using Functions.